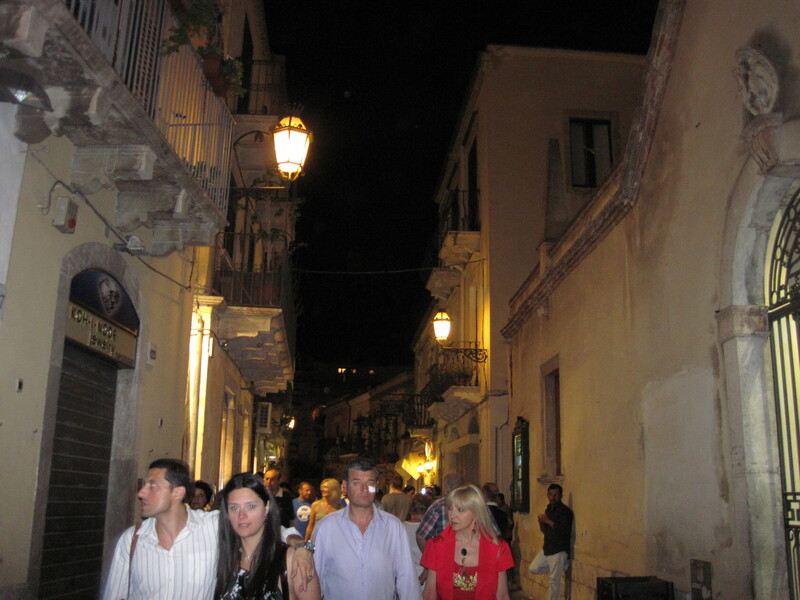 Last summer my husband and I went to Sicily for two weeks. It was an absolutely amazing vacation but Sicily is a very unique and rustic place and I think it’s really helpful to do a lot of research before you go. So, here I’ll tell you about our itinerary and hopefully it can help you a bit in planning your own trip. Feel free to completely copy it, although I think everyone likes to do their own thing! 1. 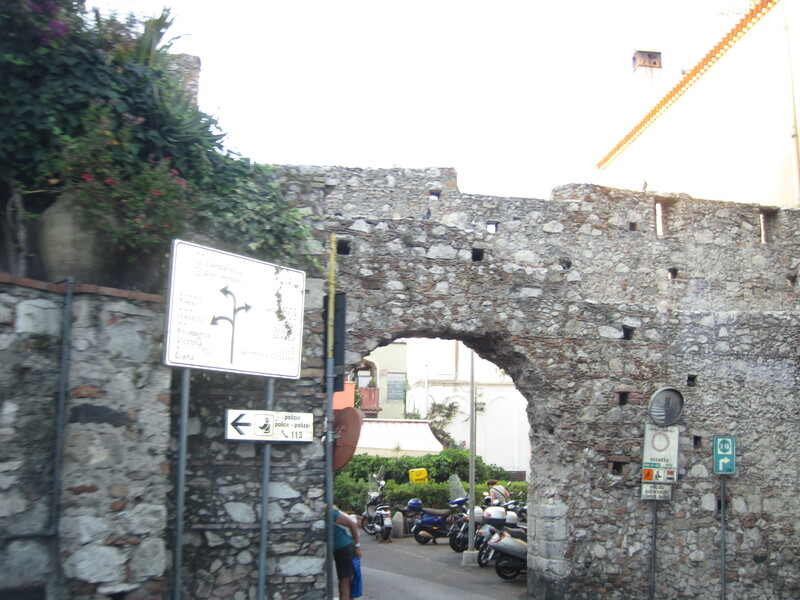 First stop: Taormina. 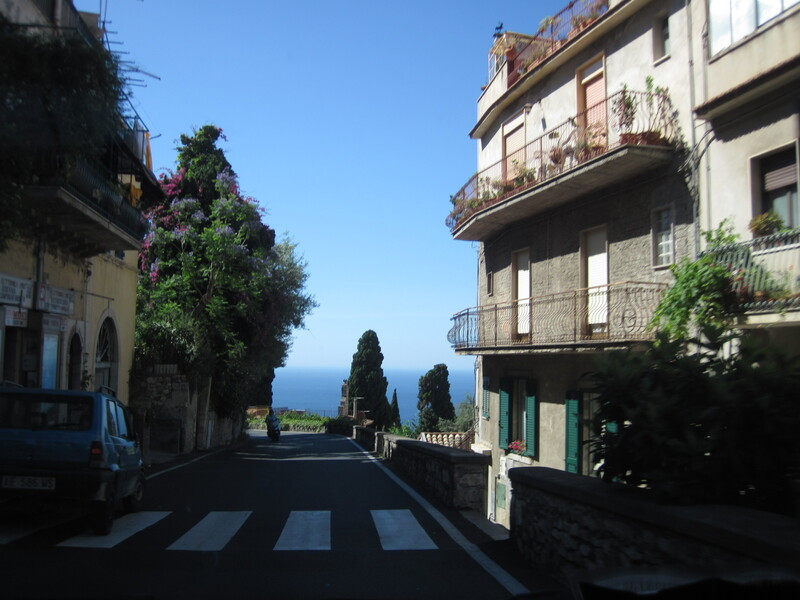 We flew into Catania and rented a car. You really need a car in Sicily because there are a lot of beautiful places but nothing is too close to anything else and there’s no reliable railway like in the rest of Italy. Plus some of the best places to visit are out of the way. 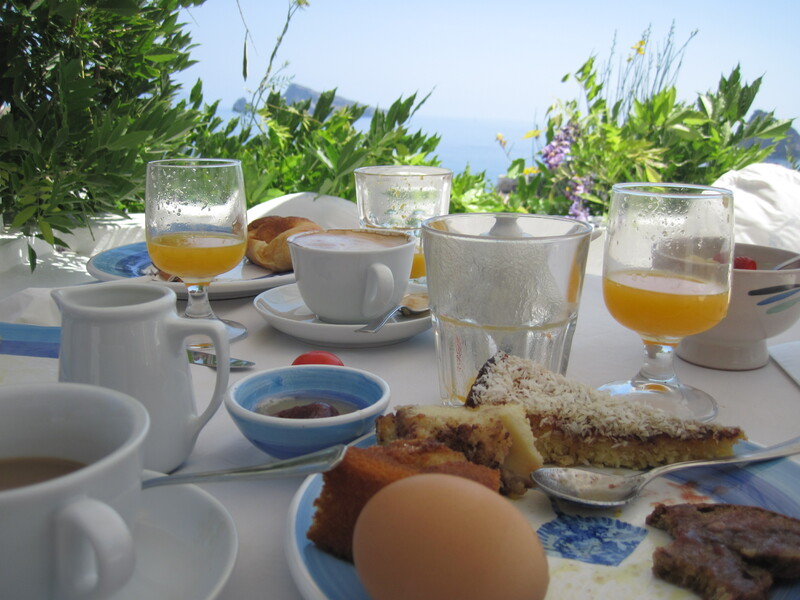 Sicily is really nothing like the rest of Italy, to be honest. 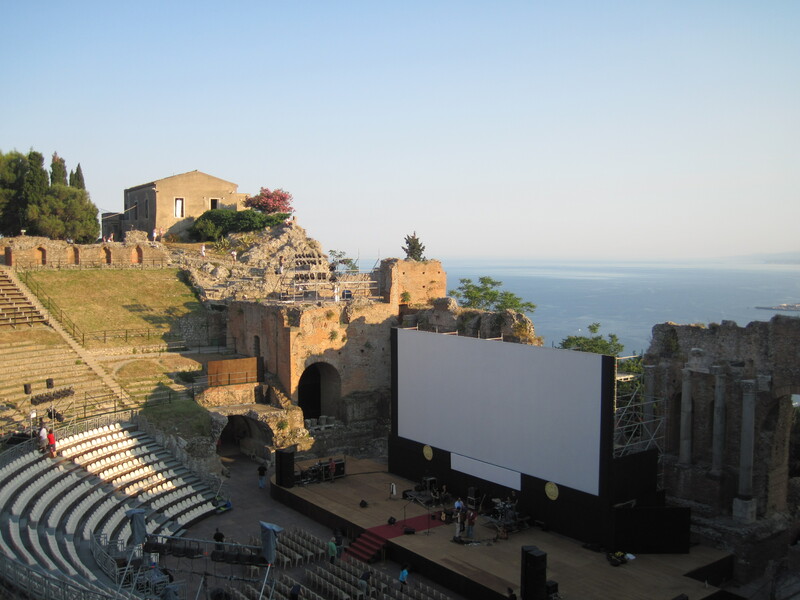 The Roman ampitheater set to host a Taormina Film Festival event. 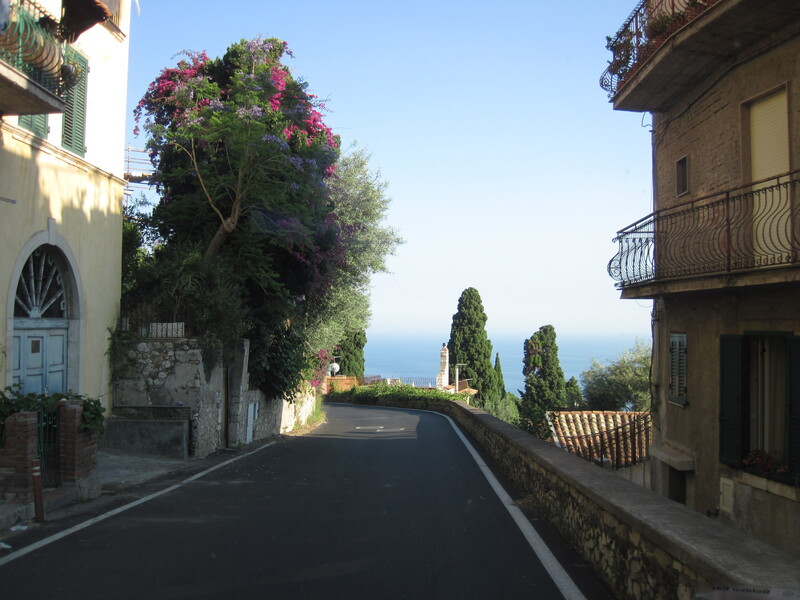 The drive from Catania to Taormina is beautiful!! You will wind around the sides of mountains, with mountains to your left and the sea to your right. 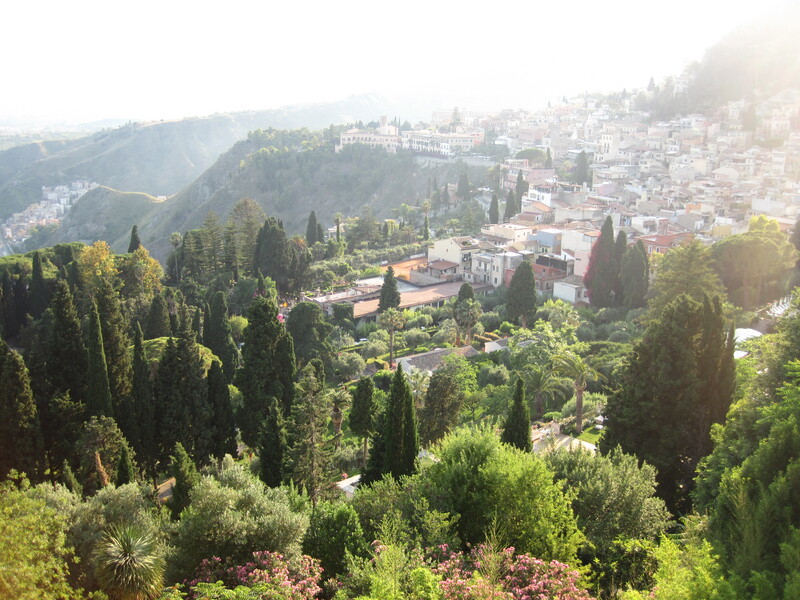 After a few turns, Taormina surprises you, a colorful village built into a mountain with beautiful beaches below and ancient ruins above, and in the distance, the ever-smouldering giant of Mount Etna. If you are using a GPS to drive into the town, beware: since the town is built on a steep hill, with many winding roads curving up the mountainside, the GPS often has trouble telling one street apart from another. It is best to have a map or know exactly where you are going. 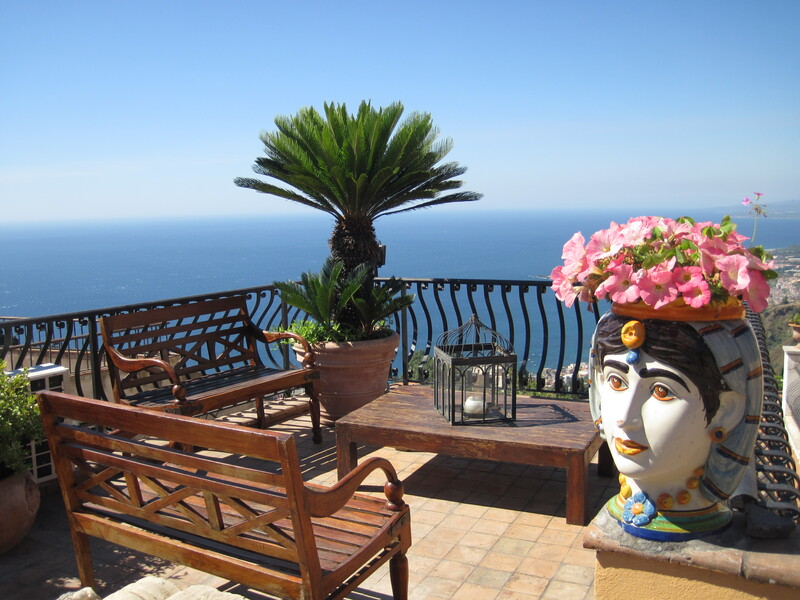 There is so much to do and see in Taormina, and such delicious food to eat!! Our favorite restaurant was: Osteria Nero D’Avola. We loved it so much we returned the next night for dinner again. The three olive oil samples were all so different and delicious. 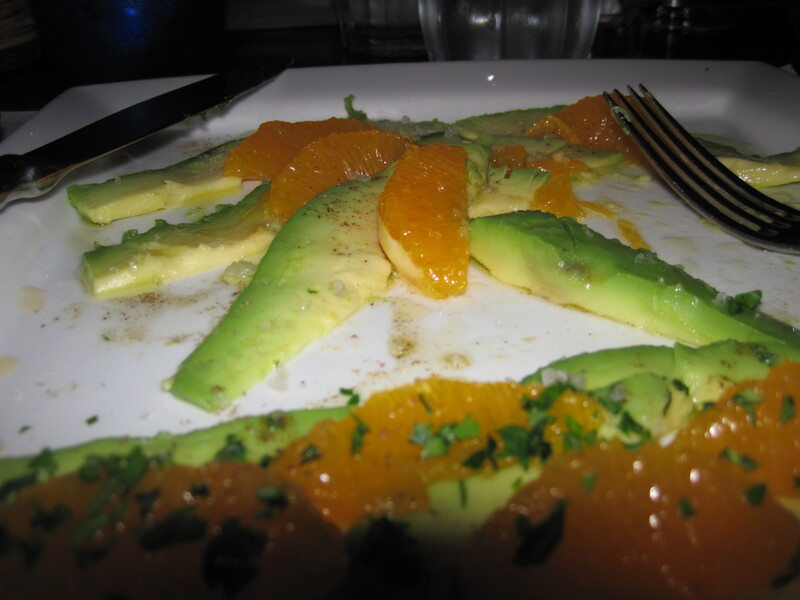 Get the avocado and orange appetizer… incredible. The setting is very quaint and romantic, in a quiet stone courtyard with pretty trees and romantic paths and gardens around it. 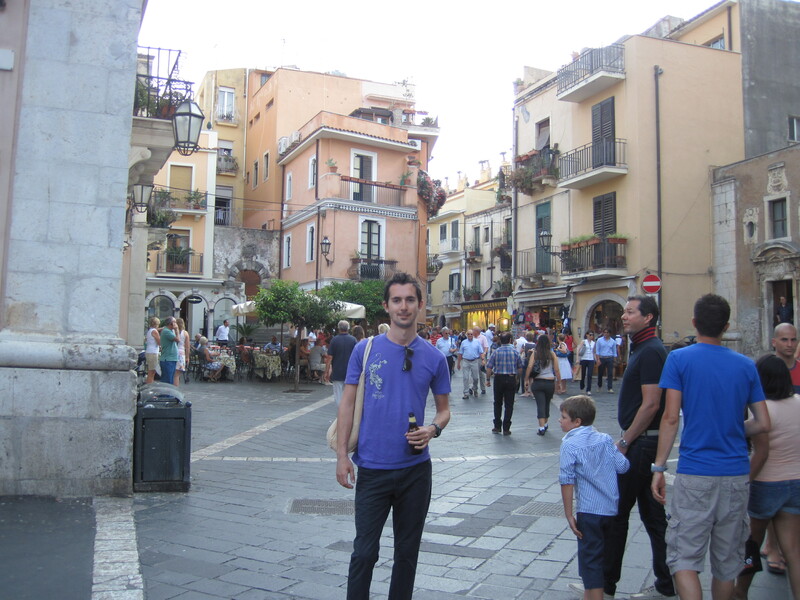 Taormina’s main street is really cute and very child friendly. 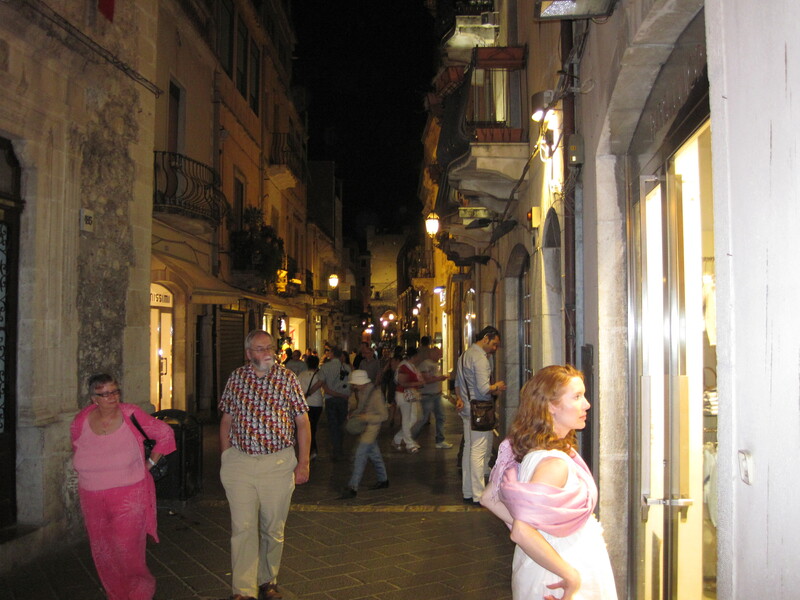 It is a pedestrian street running the length of the old town, with cute shops and amazing views of the sea. 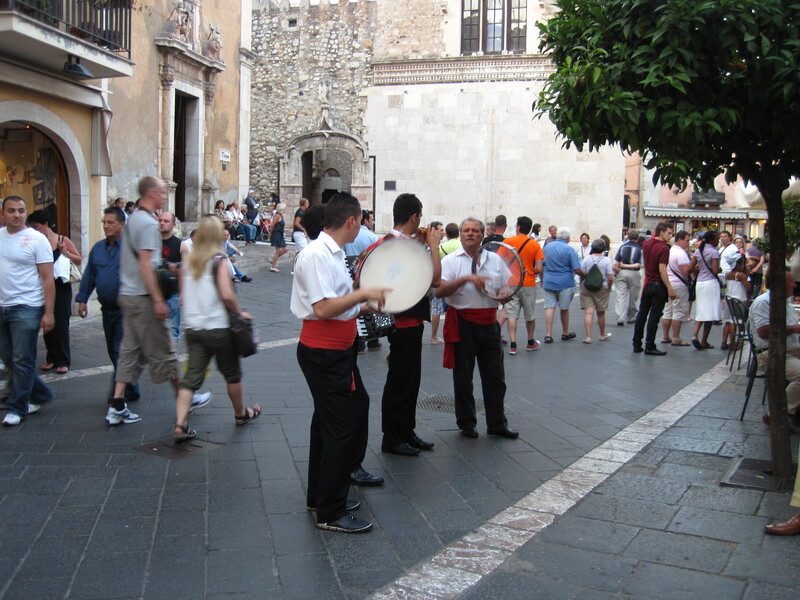 Every evening, as the sun begins to set, the locals set out in their Sunday best for their evening “passegiata”, walking arm-in-arm through the town, eager to see and to be seen. Grab a seat at one of the street cafes, order a refreshing sprtiz apreol and watch “gli belli Italiani” stroll by. They really love children here and kids from many countries seemed so happy to be running around the streets, playing in fountains, and accompanying their parents on romantic vacation dinners. When we visited, there was even a team dressed up as the town mascot (a minotaur, get it? Taor-mina … Mina-taur?) playing with the kids. 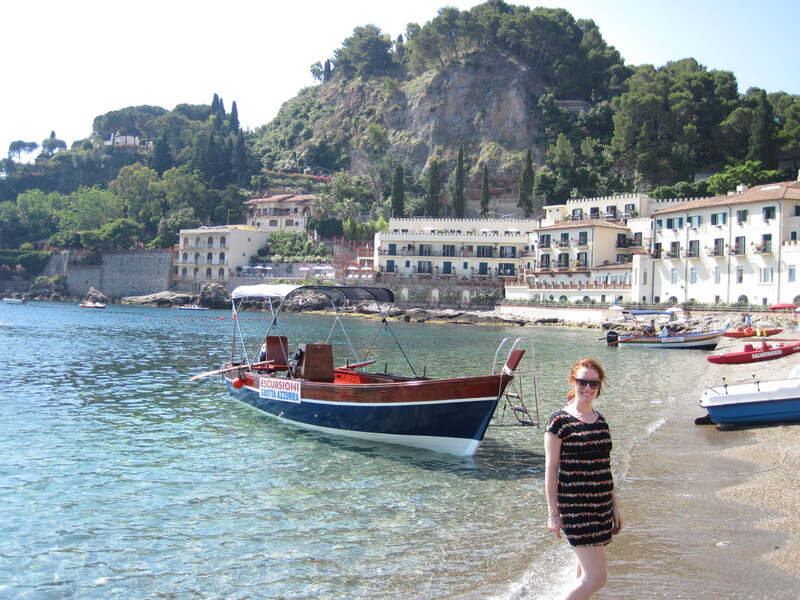 I hope to return to Taormina someday with our baby, when he’s a bit older so he can run around and play with all the local kids! 2. 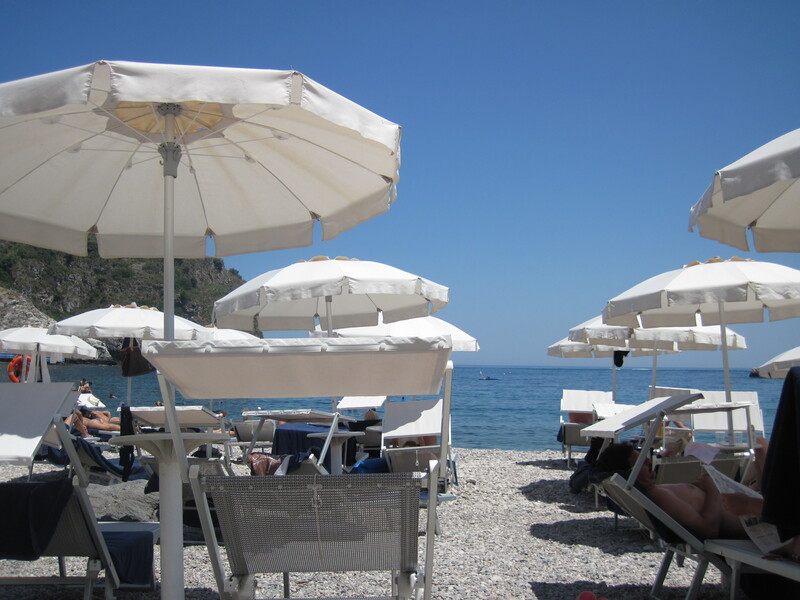 Next stop: Aeolian Islands. Here we really went off the beaten track. 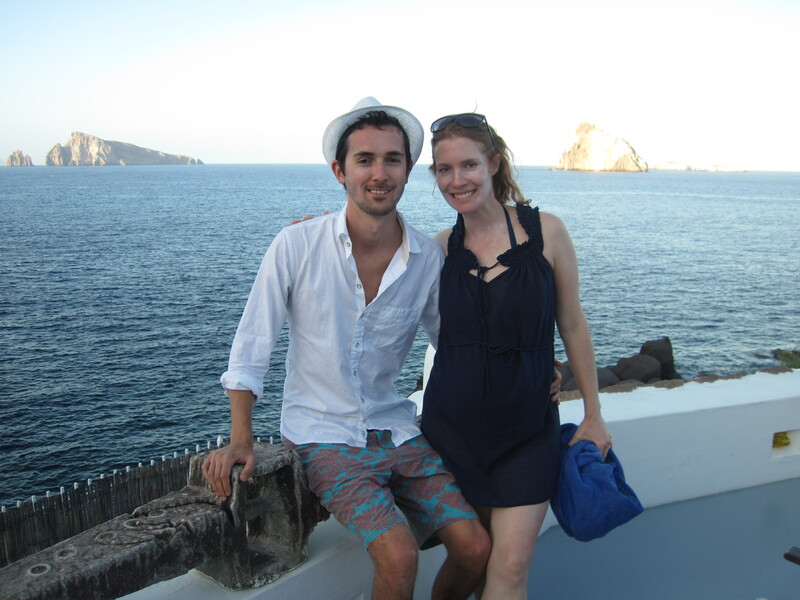 Our first stop was Panarea. The island is tiny, there are no cars, and before the high party season starts (it’s really a party island), there are hardly any people. The “taxis” on the islands are golf carts and can take you to the few beautiful secluded beaches on the islands, where the locals bask in the sun and you can grab a drink at a small white-washed tavern with a view of the sea. It feels like a private secret island but you’re in on the secret. You, and only a few other people if you come in June or very early July. 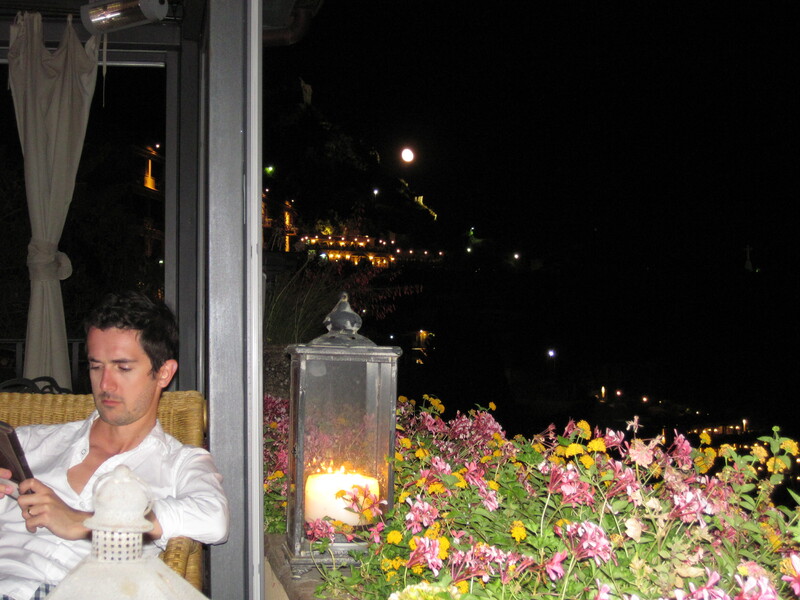 This is where we ate dinner next to Stephanie Seymour and Naomi Campbell, who visit the island and our hotel’s shop every year. We rented a small boat one day and explored the clear blue waters around the small islands you see from Panarea’s main port. There are other boaters out there, and we swam with some of them too. It felt very adventurous to be swimming at those uninhabited islands. 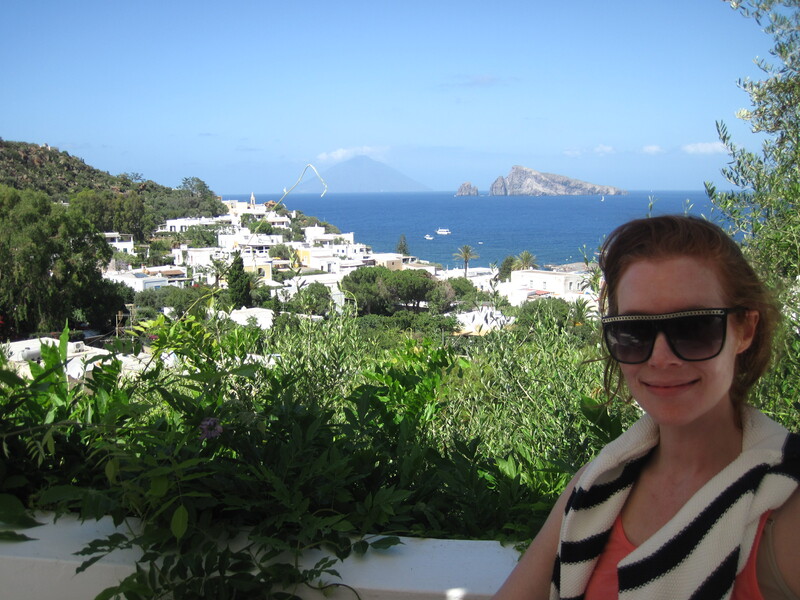 The whole experience of Panarea felt wild and primitive to me. It was very quiet and so far away from everything that it felt like we were in the outer reaches of civilization. Obviously not everyone’s cup of tea but if you’re seeking remoteness and a true escape, peace and quiet, then this could be for you. 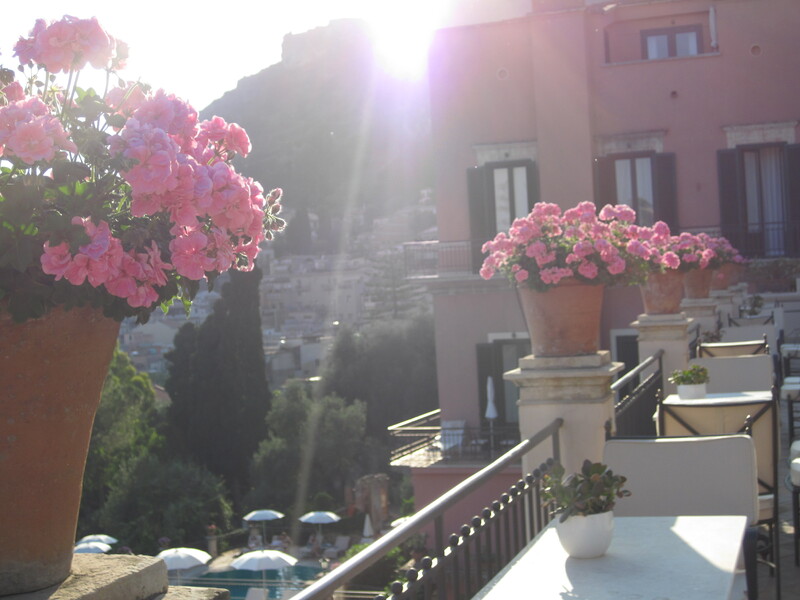 More on the rest of our Sicily Itinerary tomorrow . . . and more here and Catania here. Reblogged this on Brooklyn Baby Social.